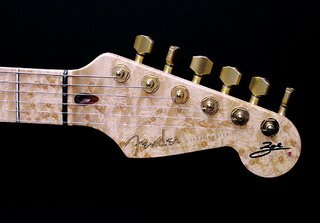 This exquisite bird's-eye maple headstock/neck belongs to Strat-o-Sister Zoe McCulloch. The guitar is #19 of 40, Hank Marvin Fender Custom Shop models, and has been even further enhanced at Fender's UK shop, with the addition of Kinman pickups and an Easy-Mute Trem. 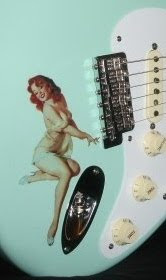 But that's not all folks-- another shop added fretboard LED's, custom paint and Zoe's logos. Reminds me of our Stat-o-Sister Lisa Baker, who similarly, can't stop refining her Strat. These women and their Strats... what'll they do next? This one already had me with the maple-- that headstock is killin' me! Geez, just look at it! Click Here or the image above for more photos and details on this guitar.